Doom Patrol Episode 5 Review: "Paw Patrol" – AiPT! 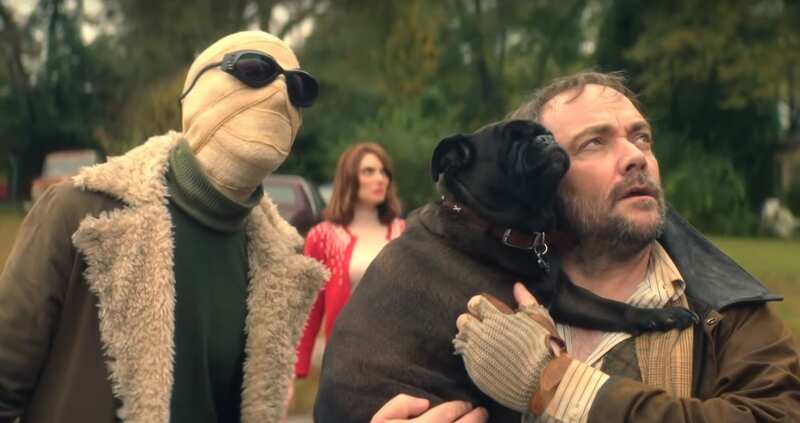 Doom Patrol Episode 5 Review: "Paw Patrol"
Metaphysics meet metafiction in the most Morrison-esque episode yet. The Decreator has been summoned and the world is slowly blinking away. If the day is to be saved, then it’s up to the team of…Mr. Nobody and the Chief?! Right up front: this episode is brilliant. Yes, it has a couple of issues, but this episode was far and away the closest that this show has come to a genuine Grant Morrison-style mind-eff. In true Doom Patrol fashion, the plan to save the world involves manipulating history in extremely specific ways, rather than using brute force against the problem at hand (though there’s still more than a little brutality involved). Let’s dive right in with the positives. This show has, with no fear of hyperbole on my end, the best ensemble cast in superhero television. So much of this episode’s success belongs to the incredible Diane Guerrero as Crazy Jane/Pennyfarthing/Hammerhead/Doctor Anderson/The Hangman’s Daughter. She’s pulling quintuple duty (at the very least) in this episode and she still manages to make each of Jane’s personalities distinct and human. Elsewhere in this episode, April Bowlby continues to be the show’s secret weapon. The more Rita lets her guard down, the more we see how much of her previous disposition was an act. Rita hasn’t allowed herself to care deeply in decades, but her newfound compassion is making her more powerful than ever. This is all communicated through Bowlby’s layered performance. A few episodes ago, her moment of panic in this episode would have reduced her to a destructive blob. Here, she pulls herself together in the hope of setting things right. It’s a great character moment that acts as plot development as well. Speaking of the plot, this week’s was a doozy. To be clear, there are still several mysteries surrounding Crazy Jane and her true past. However, this episode brilliantly uses time travel as a means to not only resolve the plot in the modern day, but to also illuminate more of Jane’s origins. It’s hard not to see the cogs turning in the writer’s room as Jane/Dr. Anderson makes her case to the other patients in her ward. The patients even make their own suggestions to Jane, bringing to mind the process of receiving and addressing studio notes (something I’m sure any adaptation of Doom Patrol has to go through). This was one of several instances in this episode that embraced the more meta aspects of Gerard Way and Grant Morrison’s runs with the characters. Through their actions, Niles and Nobody manage to save the world, but they also call Niles’ character further into question. Why did he choose to save Jane when he did? What exactly is his true connection to Mr. Nobody? And why didn’t he actually share that drink with Willoughby? What has he done? The writers are so good at answering questions while raising new ones. The show and its characters have enough well-earned mystery without having to obscure the answers for the sake of padding out a season. It never feels like the writers are purposefully dangling clarity out of your reach. Well, except for one bit. One moment that felt unnecessary in this episode was the argument between the cockroach and the rat. Yes, the show is clearly trying to establish the roach as a character for some reason, but this was the first time where its presence felt distracting from the overall plot. There was just so much else that needed to get done this week that a lengthy dialogue scene with the roach with little in the way of explaining its deal just felt like it could have been scrapped. That being said, “Paw Patrol” was still a great deal of fun. It’s just as wacky as previous episodes, but in mostly different ways. The plot structure is ambitious and the callbacks to previous episodes are cleverly executed. Most importantly, in one of my favorite “sneeze and you’ll miss it” lines of dialogue, it establishes that Willow from Buffy the Vampire Slayer exists in this universe (or the Baphomet exists in hers). The effects in this episode are perhaps the strongest they’ve been since the series began. Rita’s morphing effects are great example of “less is more.” The little bit of melting we see her do in this episode is tastefully done, allowing April Bowlby ample area to emote, even through an inhuman effect. It’s a lovely intersection between the talents of both the actress and the effects team. Even the Decreator looks good, in a decidedly silly way. The “staring contest” toward the end of the episode is wisely made to look cartoonish, fitting both the fantastical origins of the presence and the inherent comedy in the sequence. Also, the Baphomet appears somehow less unsettling in this episode. Perhaps the lack of foreboding singing had something to do with it, but she seems like a nice enough gal. Basically, Doom Patrol got super weird this week, resulting in its strongest episode yet. Fans of both the Vertigo and Young Animal eras of the team will be very pleased! Join me next week for the episode “Doom Patrol Patrol,” as we finally meet…the Doom Patrol? Doom Patrol Episode 5: "Paw Patrol"
'Doom Patrol' beautifully sticks the landing in its first completely bonkers two-parter.